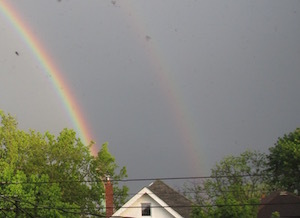 Early last evening I glanced out my front window and I was surprised to see a rainbow with colours so vivid against a grey sky. I went outside to get a better look and stood there awed by the beauty of life on our planet Earth. Listen to this song and let yourself be carried away for a few moments. This entry was posted in beauty. Bookmark the permalink. Both comments and trackbacks are currently closed.